Summer and Spain are two words that simply work well together… Long evenings sharing tapas and conversation by a Mediterranean beach, glasses of wine to accompany the occasion and the promise of an unforgettable holiday. It’s no surprise that the country is one of Ireland’s favourite destinations during the season. Rias Baixas is different and as we recently had the pleasure of experiencing, the region it’s greener and rainier than its more southerner neighbours yet one of the ultimate summer-perfect wines come from this land: Albarino, which -with the exception of a few blends- it’s usually made entirely from the grape of the same name. Ireland’s thirst for Albarino is a force to be reckoned with, we are the eighth biggest export market for it and it’s only getting bigger. Pazo Barrantes 2014 is a delightful example: it’s made by Marqués de Murrieta, a well established name in La Rioja, which ventured successfully into Rias Baixas and set up a very small (12 hectares) bodega nearby the Umia river, in the Salnés Valley, one of the sub-regions with more oceanic influence in the DO. The family is completely dedicated to quality over quantity (with the amount of space they have, the opposite would be complete nonsense!) and even the bottle deserves a little mention thanks to its textured detail and attractive transparent label. The wine is 100% Albarino, all grown in the estate, where an Atlantic-influenced weather and a well drained soil keeps the plants healthy and the fruit crisp despite a generous rainfall of 1,500 mm a year. It’s a very aromatic wine, with hints of orange blossom. With 13% ABV, it feels balanced and its body is on the curvy side of light, its colour is clear and pale lime gold. On the palate, the sharp acidity of Albarino is softened by the delicately sweet taste of ripe pineapples and a breeze-beach minerality. Citrus fruit and pear compliment the flavour that in a very well rounded fashion will make your mouth water. Rain or shine, this elegant and refreshing wine is a great idea for when you want to enjoy a white wine that’s different and that has character but that stays easy to drink. If you like Pinot Grigio and are curious to try something new and with more personality, Albarino is a must-taste. Pair it with seafood, as they do in Galicia: perhaps give it an Irish touch with a seafood coddle or go Spanish all the way and make an authentic paella. 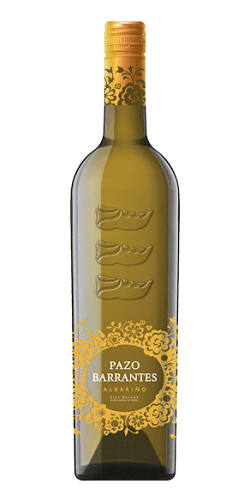 Pazo Barrantes 2014 is available at O’Briens Wines at €22.95 and it’s currently on offer at €17.95.